Kingdom manager Peter Keane says David Clifford and James O’Donoghue are nearing a comeback. David Clifford hasn't featured yet in 2019 for Kerry. ALL-STAR FORWARD David Clifford may make his seasonal debut for Kerry against Mayo on Saturday night in their sold-out Division 1 encounter at Austin Stack Park. 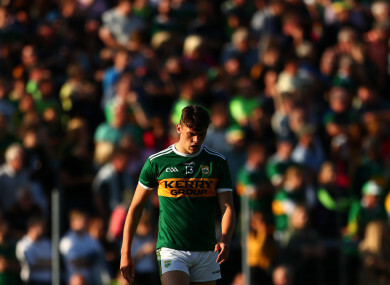 Clifford underwent surgery on his shoulder during the off-season but Kerry manager Peter Keane said the attacker is “not far away” from a return to the field, while James O’Donoghue is in a similar position. Two players who’ll miss out this weekend are David Moran and Paul Geaney. The pair are also unlikely to return in time for the round 7 clash against Roscommon. “Paul Geaney has had a procedure done on his back and will not available on Saturday night or probably for our trip to Roscommon and the same applies to David Moran who has tendinitis,” said Keane. The Kerry boss confirmed that Killian Young is a long term absentee, but the players who featured for their clubs on Sunday – including Tommy Walsh, Gavin O’Brien, Jack Sherwood, Tomás Ó Sé and Adrian Spillane – are available. Jack Barry, Seanie O’Shea and Dara Moynihan were held back from club duty because of their workload since mid-January. “We are reasonably happy to have five games won but ultimately that was not the plan,” added Keane. Email “All-Star forward could make Kerry return this weekend against Mayo”. Feedback on “All-Star forward could make Kerry return this weekend against Mayo”.